Spirited Stories from Across the U.S. I mentioned on the first Thirsty Thursday – newspapers around the country publish their food sections on Wednesday and Thursday during the week. Many of these papers (outside the bible belt! ), include stories featuring drink recipes. On this Thirsty Thursday, I’ve took the liberty of sharing some of those summer drink stories with you – my loyal reader. 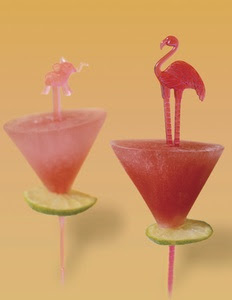 This summer everyone is buzzing about Rose wine and fresh fruit in cocktails. Click here for a good read on the simplicity of serving a Rose from the LA Times. 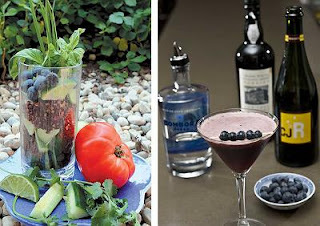 For some more complex cocktail ideas with fruit, The Chicago Sun Times brings you advanced recipes fresh from the garden. Infuse your own fresh fruit vodka with tips from the South Florida Sun-Sentinel. I am going to try this very soon and I’ll report back on the results. The Minnesota Star Tribune recommends frozen margarita recipes. My advice: splurge on the tequila. You don’t need to throw a fifty to Pat Rone, but just don’t buy the cheap stuff. Possibly a reader of A Shot of Brandi*, the Philadelphia Inquirer takes a stab at poptails. There presentation (left) is much more impressive! If you are a cocktail-geek like me, I recommend following Eric Felton’s column in the Wall Street Journal on Saturday’s. He provides readers with a cocktail recipe, accompanied by a story on where the drink originated. Memorize a nugget from his story and impress guests at your next shin-dig. Last week, Eric featured Planter’s Punch. While it isn’t a newspaper, the blog Yum Sugar reviewed Food & Wine magazine’s new book on cocktails. I recommend reading Yum Sugar daily for great party inspirations, cocktail and food recipes. (Sources: startribune.com, Canada.com, wsj.com, yumsugar.com, sun-sentinel.com, philly.com, suntimes.com, latimes.com. Pictures from suntimes.com, philly.com). Playdough or Play-doh? You decide.